There are two things I love to do in this ancient city...take boat rides and watch the moonrise. I'm known to head to a nearby beach or river dock to see my lunar friend come up over the horizon. Recently, I had the pleasure of experiencing both of my loves simultaneously. It was remarkable and I look forward to doing it again. St. Augustine's municipal marina is home to the Schooner Freedom. It's a beautiful sail boat that makes passengers feel like they're on a film set. 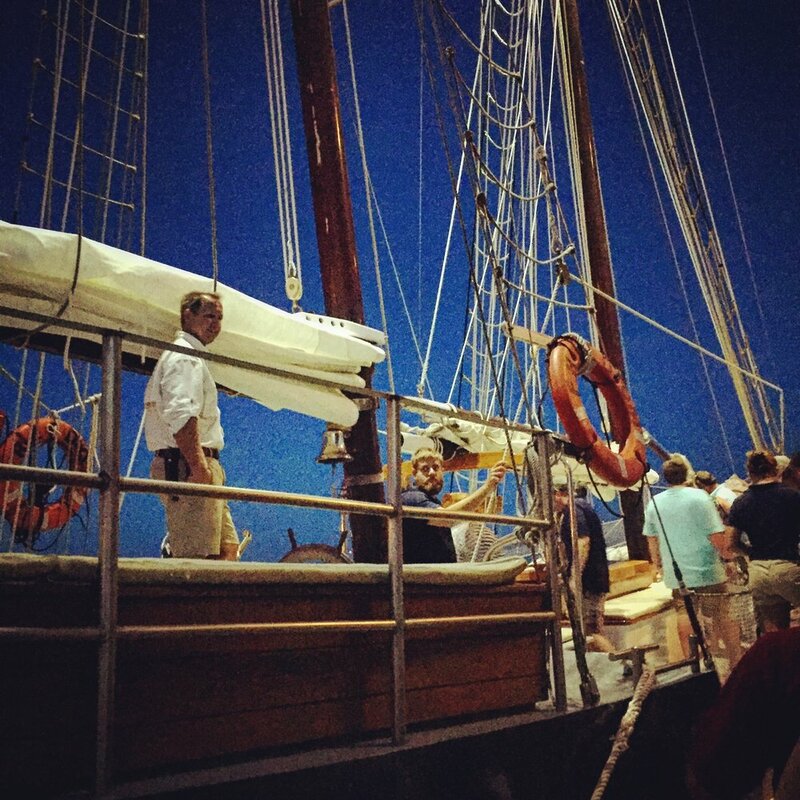 They host regular sailing excursions including a monthly full moon sail. Shortly after boarding, a few of us were invited to help raise the sails - super cool and an incidental workout. The full moon sort of snuck up on me as I happened to sit on an east facing seat onboard. You probably know the sight...a full rich golden moon just over the horizon; giving the illusion of being enchantingly enormous with the landscape of homes and trees in the foreground. The sight always leaves me speechless and in awe. The crew was made up of a cool variety of folks. They were knowledgeable and enthusiastic about all things nautical and mingled with us passengers during the sail. Admission on the Schooner Freedom includes a variety of beer and wine. As we got farther from the marina and darkness fully set it, the experience became more and more surreal and sensory. An acoustic guitarist/vocalist played familiar songs like "Over The Rainbow" during the sail, which was a pleasant touch. We passengers all seemed pensive for most of the sail. Being on the water is calming and spurs quiet reflection on things as simple as the day's events or as profound as our place in the universe under shining celestial bodies. The sail was a special one. By the time it was over, one romantic passenger had proposed to another!